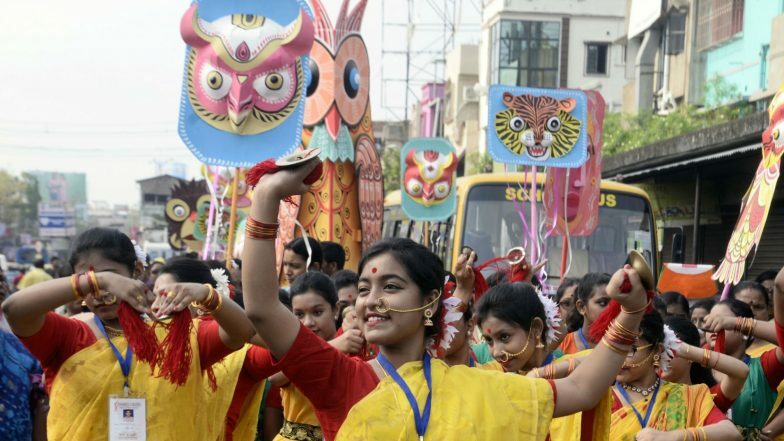 Kolkata, April 15: West Bengal on Monday ushered in "Poila Boisakh", the Bengali New Year, amidst traditional gaiety and fervour. The first day of the year is all about dressing up in new clothes, exchanging pleasantries, traditional sweets and "shubho naba barsho" (happy new year) greetings. Various temples like Kalighat and Dakshineshwar witnessed a huge footfall as devout Bengalis offered prayers, flowers and sweets wishing a fruitful year ahead. Pohela Boishakh 2019 Wishes and Messages: WhatsApp Stickers, Poila Baisakh GIF Images, SMS to Wish Your Family and Friends on Bengali New Year. Revellers, cutting across religious barriers, celebrated the day with family and friends. During this time of the year family members fly back to Bengal from across the world to be with their near and dear ones. Chief Minister Mamata Banerjee extended her greetings to everyone on the social media. All sorts of sweets starting from traditional sandesh (cottage cheese sweet), Rosogolla (sugary spongy sweet) to sugar-free and fusion sweets kept flying off the shelves of all confectioners. With the day also marking the start of a new financial year, shopkeepers and businessmen observed the "haal khata" ceremony -- closing their old account books and opening new ones. Smiling traders welcomed customers with sweets and new Bengali calendars, as people went on a shopping spree. Poila Baisakh (Pohela Boishakh) 2019 Date: Know History & Significance Behind the Celebration of Bengali New Year. The Bangabda or the Bengali calendar was promulgated in 1584 A.D. by Mughal emperor Akbar. Initially known as the "Tarikh-e-Elahi", the purpose of the calendar was to glorify Akbar's ascent to the throne along with facilitating revenue collection.